Although many women still baked their own bread in the late 19th century, those living in large cities and towns usually brought their bread from a baker. 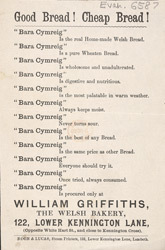 Bought bread was not highly regarded among the upper classes, however: it was thought to be unhygienic and likely to go stale very quickly. Some bakers were also known to add alum (a chalky deposit used in dyeing) to make their bread whiter.